Franschhoek is highly regarded for its wines – particularly MCCs, or Methode Cap Classique, of which there are 17 producers in the valley – and its food, boasting some of the best restaurants in the Western Cape. Combined with its exquisite natural beauty, no wonder it is a preferred destination for weddings. The quaint village is filled with pavement cafes, art and antique shops, and boutiques, as well as some of the larger retail stores. Along with all the wine farms to visit, under your own steam or on the Franschhoek Wine Tram, the French Huguenot museum, and top class award-winning eateries, there are regular festivals and events, and food and wine routes (more information at http://franschhoek.org.za/) so it’s well worth planning an extended stay in the area. 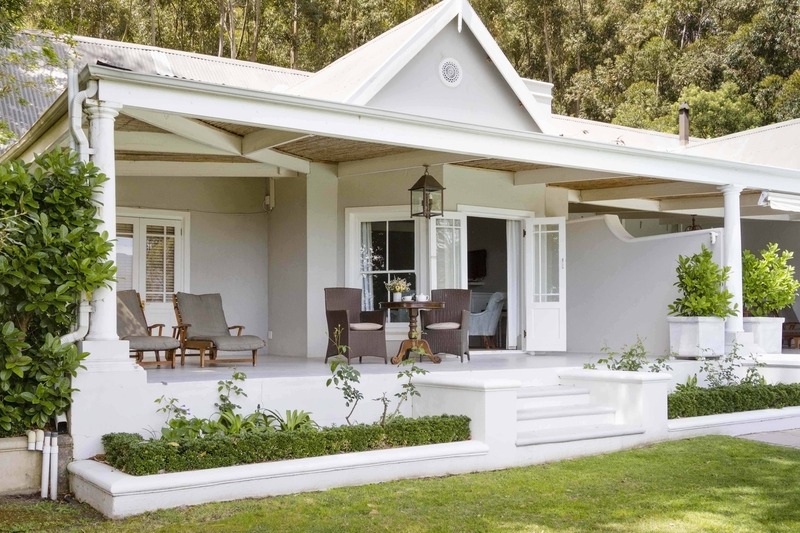 You can take your pick of hotels and guest houses, but to soak up the atmosphere of the winelands, accommodation on a working wine farm is hard to beat. La Petite Ferme is a multi-award winning boutique wine estate overlooking the Franschhoek Valley from its position on the slopes of Oliphants Pass and Middagkrans Mountain. Refurbishments and upgrades have been taking place since it came under new ownership in October 2015, and the result is of the utmost luxury. The five-star establishment offers several different suites. I spent a night in the Verandah suite which is located in the Manor House, flanked by two smaller suites. The room itself is long from left to right, and opens through French doors onto a massive, well, veranda. It’s big enough to hold two sun loungers; a couch, two armchairs and a coffee table in front of a huge built in fireplace with enough wood for days; and another occasional table with two chairs. An elaborate chandelier hangs from the middle of the ceiling, and it’s completely sheltered from the wind. The view faces westward, and a few steps down from the edge of the stoep is a sparkling blue swimming pool. This in turn overlooks the vineyards which drop down the hill below. Beyond all that is the vista of the valley, bordered by blue gums on one side and stretching all the way over Paarl on the other. A blistering hot day with the temperature still in the high 30s in the late afternoon, the only thing to do was crack open a bottle of crisp, cold sauvignon blanc, slip into a bathing suit, and hop in the water, wine glass in hand. With no sound other than the wind hissing through the trees and the hadedahs, it was blissful simply to sit back and enjoy the surroundings, as the sun set behind the mountains. Inside the room is a king size bed which faces the veranda, and a large en-suite bathroom with walk in shower, double his and hers basins, and a deep bathtub with all the toiletries and accoutrements necessary for steamy and relaxing ablutions. There is excellent wifi, and the air conditioning is very welcome during the summer heat. Breakfast the following morning is taken in the restaurant, or if you ask nicely, at an outside table overlooking the lawns and the vineyards. 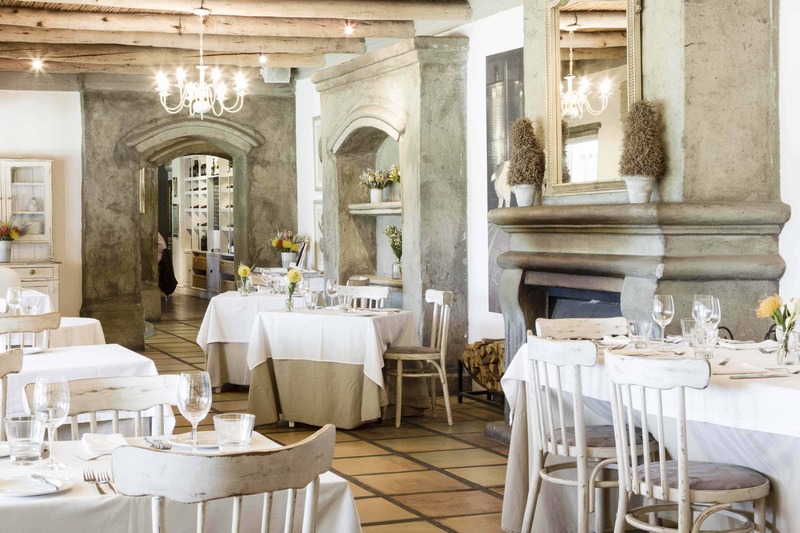 There is a standard buffet with cereals, fruits, cold cuts, and cheeses, as well as your choice of a hot meal – I recommend the scrambled eggs with Franschhoek salmon trout, a basket of toast, and a pot of Earl Gray tea. The restaurant at La Petite Ferme is open daily for lunch 12pm-3.30pm, and dinner is Thursdays to Sundays from 7pm-10pm. The bistro serves tapas until 8pm, or you can order room service. The tasting room is open daily from 9am-5pm where you can taste and educate yourself on the La Petite Ferme wine selection. Daily cellar tours are available at 11am by appointment.